I have a complicated relationship with business travel. On the one hand, I hate it; the time spent away from my family, charmless hotel rooms, and long work days leave me tired and grouchy. On the other hand, how can I hate something which has given me wild opportunities to see far flung corners of the world, live like a semi-local in some truly stunning cities, and introduced me to my husband. But on the other hand… I still hate it. Let’s take last week as an example. I spent the week in Paris, one of the most interesting cities in the world, and ended up sitting in the office every night until midnight. Which is kind of like going to a 3 star Michelin restaurant and only ordering the bread basket. Le sigh. But moving on. One very positive thing which has come of years of business travel is a certain forced open mindedness to new foods. If there is a polite way to tell a colleague or client that, no, you do not want to try the local delicacy which they are so proudly presenting to you, I have yet to figure it out. I’ve had coworkers plead made-up dietary restrictions or upset stomachs. Me? I generally just give whatever it is a try. Which means that I’ve eaten some pretty interesting foods and none of them has killed me yet. Even the supposedly poisonous Japanese blow fish. 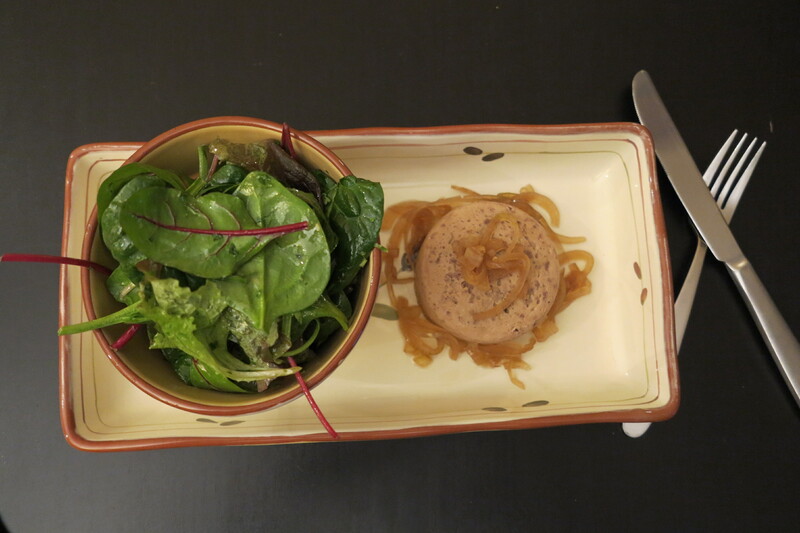 So what harm could a little Chicken Liver Gateaux with Pickled Onions possibly do? Yes, it has been a very, very busy few weeks. But I also knew that if I didn’t join in for this week’s French Fridays with Dorie recipe, I would probably be kicked out of the group for having nominated (and campaigned for) this recipe in the first place. I know that quite a few of my fellow Doristas were less than excited about this week’s assignment, and may I just say that I am incredibly proud of all those who bravely gave it a go. So now a confession, I actually like liver. No idea why, maybe because I never had it as a child and thus don’t have any psychological liver scars. But even so, this recipe sounded weird. I will not go into details, but I’m sure some of the others will so you can check their blogs if you want to hear the gory details. But I made it through and it actually turned out to be an incredibly easy and tasty recipe. I served it up with a side salad and for dinner and then had the leftovers on toast the next day. My husband like it too so two thumbs up in my household. This one was good, huh? When I am back to my 100% self, I will make it again so I can eat it, not just taste. And Paris working until 10pm? Not fair!!! You are a brave soul! My mother used to make me roll chicken livers in bacon – the texture & smell of the 2 raw meats was just gross! Your photos are wonderful & your plate looks very French! Haha–good thing you worked this one into your schedule. This recipe was all your doing! In the end, I wasn’t brave enough. My bad. I couldn’t stomach it either – not a liver girl! But your plating looks very nice! Personally, I found Japanese blowfish to be mostly tasteless and not so impressive. 😉 I understand how you feel about travel and the opportunity to try new foods. I’m actually glad this recipe was campaigned for! It turned out better than I thought. I just wish mine had come out looking as good as yours does! I agree, the blowfish was bland. But this dish was not so I’m happy that we could finally agree to make it. So glad to hear you enjoyed the recipe that you suggested for the group! I may cook it this weekend but have to find the livers first. Your picture of chicken liver gateaux is beautiful! Glad you liked it…I am just NOT a liver lover! Rose, you certainly presented the Chicken Liver Gâteau with the pickled onions and the side salad in a very elegant way! So glad to read that you and your husband also enjoyed this recipe and you had the opportunity to try so many intriguing and exotic dishes – enviable! Have a great weekend (and stay warm – it is cold around here, especially at night)! Looks great, Rose! I’m so glad I made, tasted and loved this dish, too….so it was all your idea??? Now the truth comes out! We have YOU to blame for this making the list this month!! Just kidding, of course, but I couldn’t do it. I’m one of the ones with “psychological liver scars”. Beautiful presentation:) I did not attempt this recipe. I have too many childhood memories involving liver. Ouch – it would be so hard to go to Paris but stay in the office. Glad you liked the gateau – I liked it cold, but warm not so much. And not enough to try it again. Your liver looks great! I grew up on fried liver with onions and I like it, I didn’t make this recipe but purely because of the crazy heat we are having here in Australia. The thought of cooking and eating liver just wasn’t appealing! I caught up on a summer dish I missed out on when it was our winter. Love your views on business travel. I also find a love/hate…or more like an inspired/drained outlook on the whole thing. But my trips involve Pittsburgh and not Paris 🙂 The analogy about getting the bread basket was hilarious. Glad you enjoyed this one and I love that serving plate and bowl- lovely. Yay! We finally got to make this. I liked it quite a bit, especially the smooth texture. What will you campaign for next? Too bad that you were working so late in Paris. My years of business travel never brought me anywhere quite as exciting. I was mostly in the midwest in hotspots like Peoria and Detroit… Sigh. Love your post! I’ve nominated and voted for this one as well. Of course, I’d never read the recipe and that it was supposed to be served warm… It wasn’t what I expected and it was fun. Made a retro pâté too. Just because. (Oh, and while I don’t go to places like Paris, I travel for work too. I know what you mean.). I have a friend who works in cities all around the world, sometimes for months at a time and rarely gets to see much but the inside of an office. It can’t be fun. On the other hand, she travels a lot in between assignments. Like you, I’ve always been a liver lover – my mother’s liver and onions were always a hit growing up. I think suggesting this recipe was a great idea – it’s a stretch for some of us, but it’s also another of those ridiculously easy, impressive dishes that I’ve come to expect from this cookbook. How sad that you weren’t able to enjoy your trip to Paris, but duty calls! I don’t think any of us would have kicked you out if you hadn’t made this one – even though you did nominate it! 🙂 Your dish looks pretty and I am glad that you enjoyed it! For some reason, I have no problem eating pate in restaurants, but the thought of making myself makes me want to gag. Here’s hoping you get more time at home with family and that your work life doesn’t stress you out too much! Didn’t you know there was a rule about not kicking anyone out from the FFWD group. In the bylaws!!! I do understand the Ying and Yang of business travel but think you realize that the plusses far outweigh the minuses. Or, at least I hope they do. Oh, the memories you must be making. 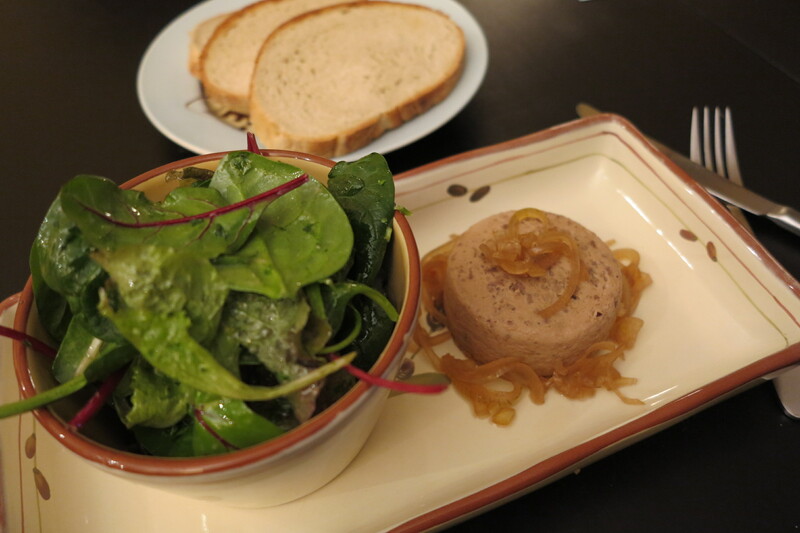 I certainly enjoyed the result and will make both the chicken liver mixture and onions again. It was tasty, more so, in my opinion, cold than warm. Thanks for pushing us to get it on the calendar. I think those of us who made it are glad we did whether we liked it or not. You deserve another week in Paris just for yourself! It’s awful to go someplace for work and only see the inside of the conference room (happened a lot to me too-and I could never understand why travel then?!) Your dish looks great and a side salad and bread was a nice way to serve it. Glad to see that this one went over so well at yours! 🙂 Half of our household liked it and the rest, including me – not so much… maybe it’s because I didn’t grow up eating liver and onions?? … LOL! Glad you liked it! And thank you for helping the group tackle one of the more “challenging” recipes!